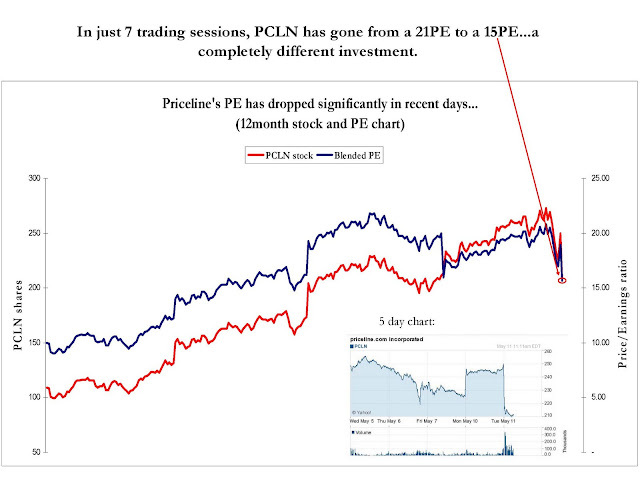 Shares of Priceline (PCLN) are down significantly today, after reporting earnings last night. The company beat earnings estimates by 4cents, but is reducing guidance for the June quarter, partly due to cancellations from the Iceland Volcano flight disruptions. In just a few days, the shares have become much more enticing from a valuation perspective, with a net-of-cash "blended" (based on the average of 2009/2010 eps estimates) PE of 15, down from 21 just a few days ago. That is more in line with the company's growth rates - sales growth of 31% for 2010 is expected to slow to 20% in 2011. Unrest in Thailand forced the company to move its operations to a more secure location, (still within the country) and resulted in a $10million hit to EBITDA.